Hispanics have voted in record numbers in recent years, but their turnout rate continues to lag behind whites and blacks, according to a Pew Research Center analysis of Census data. Hispanics today make up 11.3% of all eligible voters. But voter turnout among Hispanics has not kept pace with the growing number of eligible voters in recent national elections. In 2010, Hispanics cast a record 6.6 million ballots out of 21.3 million eligible voters, a turnout rate of 31.2%. But that was still far below the turnout among black voters (44%) and white voters (48.6%). A record 24.8 million Hispanics are eligible to vote in 2014, according to February Census figures, up from 21.3 million in 2010. Some suggest that Hispanics might stay home on Election Day this year out of dissatisfaction with the president over immigration policy, while others predict Latinos will turn out in record numbers. As groups push to register Hispanic voters in advance of this fall’s midterm elections, frustration has mounted over stalled immigration reform in Congress and the continued deportation of unauthorized immigrants under President Obama. Support for the president among Hispanics has eroded since September 2013, according to a recent Pew Research Center survey. A low voter turnout rate among Hispanics stretches back several midterm elections. Since 1986, the turnout rate has dropped from 38% to 31.2% in 2010. The gap in turnout rates between whites and Hispanics has increased from 12.7 to 17.4 percentage points over the same time period. Nevertheless, Hispanics made up a larger share of the electorate in 2010 than in any previous midterm election, representing 6.9% of all voters, up from 5.8% in 2006. In 2010 House races, Hispanics favored Democrats over Republicans by 60% to 38%. 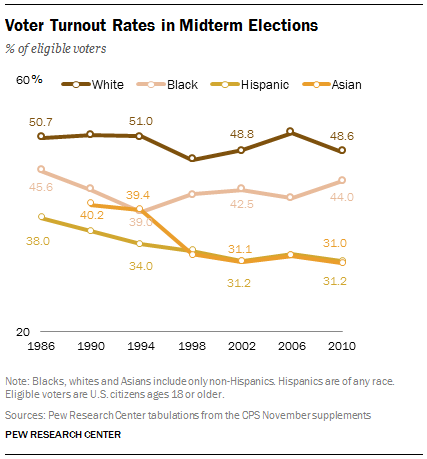 Voter turnout rates in 2010 varied among Hispanics. College graduates had the highest turnout rate (50.3%), and young people under 30 were least likely to vote (17.6%). Nearly half (49.3%) of Cuban-origin Hispanics voted, compared with just 28.7% of Mexican-origin Hispanics. Some 800,000 Hispanics—the vast majority U.S. born—turn 18 each year, a demographic wave that’s projected to double the Hispanic electorate by 2030. The relative youth of the Hispanic electorate has helped drive down the group’s overall turnout. In 2010, 31% of Hispanic eligible voters were under 30. By contrast, 19% of white, 26% of black and 21% of Asian eligible voters were under 30. People give similar reasons for not voting, regardless of race or ethnicity. Among registered voters who didn’t vote in 2010, one-in-four Hispanics chose “too busy, conflicting work or school schedule” as the reason they did not cast a ballot. About the same percentage of non-voters overall chose the same reason. Nearly twice as many Hispanics as non-voters overall said they forgot to vote, 13.3% to 7.5%.